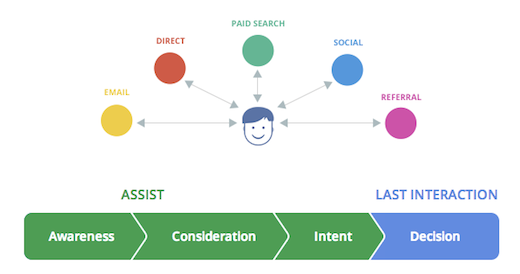 The Path to Purchase | ASTRALCOM - Content Strategy, Conversion Marketing and Customer Acquisition. Sometimes, even just tweaking a few things at the initial customer landing can have a dramatic impact on key performance indicators (KPIs), deeper in the experience. In our post The (Long & Sometimes Winding) Road to a Conversion, we talked about the circuitous routes that consumers can take on the path to purchase. We saw how different media channels (display ads, organic search, paid search, email, etc) helped to support other channels and how these channels all worked together to help create a goal conversion or sale. • Last Interaction: channels that act as the last point of contact prior to a purchase – Something called the ZMOT, which we’ll get into in an upcoming post. You’ll clearly see how each media channel also influences consumers in different ways and that’s why context is such an important issue in messaging tactics. From an ASTRALCOM perspective, this report was important because it validated the majority of our thinking and messaging philosophies. For example, we’ve long held true to the notion that larger purchases require longer sales cycles and more engaging customer interactions; which should be factored into the overall customer experience. Sometimes, even just tweaking a few things at the initial customer landing can have a dramatic impact on key performance indicators (KPIs) deeper in the experience. Read Google’s superb info on this topic. Then, let’s have a conversation about optimizing the path to purchase for your visitors.